Autumn is a time for comfort. As the weather gets cooler and the trees put on their vibrant display, we seek the comfort of cosy fires, blankets, and yummy food. The popular foods of autumn are those which also evoke the feeling of hygge, which is why hot coffee and pumpkin spice have become staples of the season. The recipe I will be sharing today is the perfect addition to a warming cup of tea or coffee on a chilly afternoon. 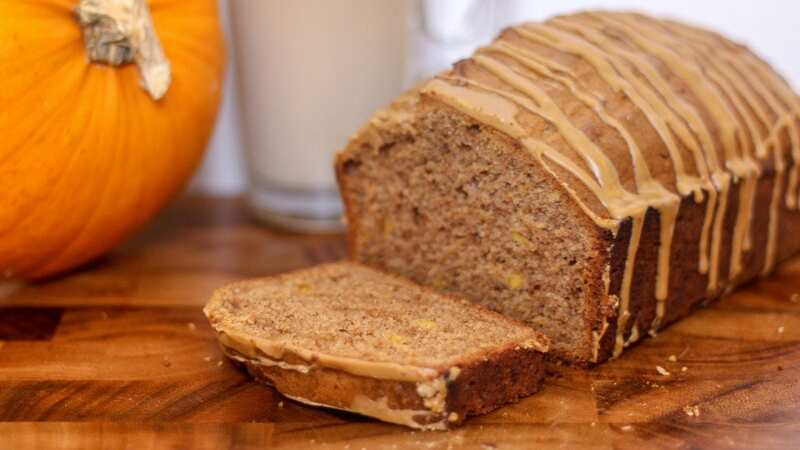 This pumpkin spice cake contains real pumpkin, and so has the added benefit of adding fruit and vegetable to your diet. It is also spiced with the perfect blend of cinnamon, nutmeg, ginger, and others, to mimic the pumpkin spice we all love. Add in a mild coffee flavoured latte icing, dribbled liberally all over the top, and you have the perfect autumn cake. Check out the recipe below. All spices should be ground. This creates a pumpkin spice mix that will be a good deal more than you need. You can set the mixture aside and use to flavour other baking, or even coffee, if you wish. Preheat the oven to 200 degrees, or 180 for a fan oven, gas mark 6. Chop your pumpkin in half and scoop out the seeds. Remove the skin of the pumpkin and chop the flesh into small chunks – a few cm in diameter each. For the cake, you will need around 300g of cooked pumpkin, but the cooked pumpkin weights quite a bit less than the raw pumpkin. Aim for around 700-800g of diced, raw pumpkin – about two-thirds of a medium-sized fruit. Place the pumpkin in a baking tray and cover with a thin layer of oil. Bake in the oven for around 45 minutes, or until the pumpkin flesh is soft and beginning to brown. Place to one side to cool. Once cool, puree 300g of the cooked pumpkin, using a masher or blender. Meanwhile, line a loaf tin with baking parchment. In a large mixing bowl, beat together the butter and sugar until the mixture is light and fluffy. Beat in the eggs. Next, gently fold in the flour, pumpkin spice and pumpkin purée into the mixture. Pour or spoon the mixture into the prepared loaf tin, making sure to get into the corners and spread evenly. Bake in the oven for around 1 hour, or until a skewer comes out clean. At the 30 minute mark, cover the cake in foil to avoid the top browning too much. Once cooked and slightly cooled, turn out onto a wire cooling rack to cool completely before icing. For the latte drizzle, warm four or five tablespoons of whole milk. You may use a hob or a microwave but take care that the milk is only hot, not boiling or burned. Stir in 2 teaspoons of instant coffee. Set aside to cool. Alternatively, you could use cool milk and a cooled shot of espresso. Add a few teaspoons of espresso into the milk until you get the desired flavour. Once the latte mixture is cool, slowly add it to the icing, one teaspoon at a time. Take care not to add too much milk – the icing should be pale brown and have the consistency of glue. If it is too solid it will not pour, too runny and it will slide off the cake. Once the icing is the perfect consistency, drizzle all over the cake so that it runs down the edges. 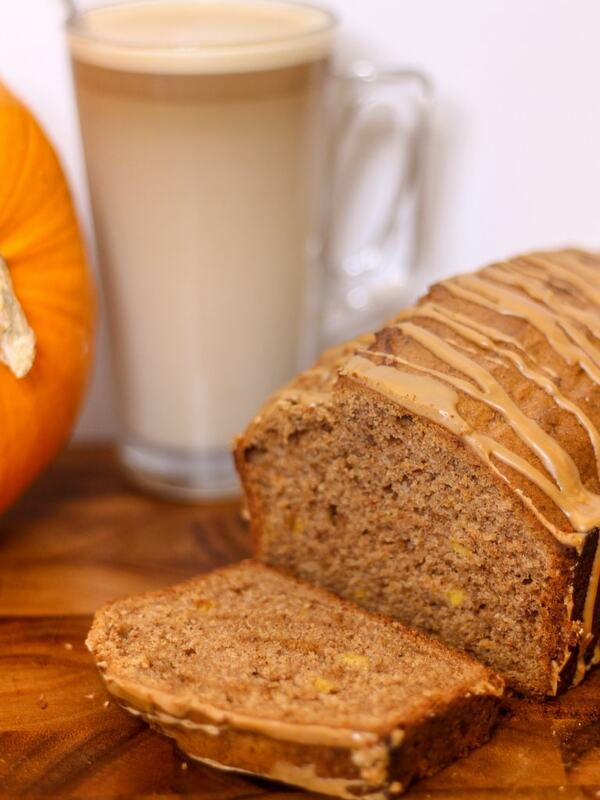 Finally, leave until the icing has set and then your pumpkin spice cake is ready to enjoy. 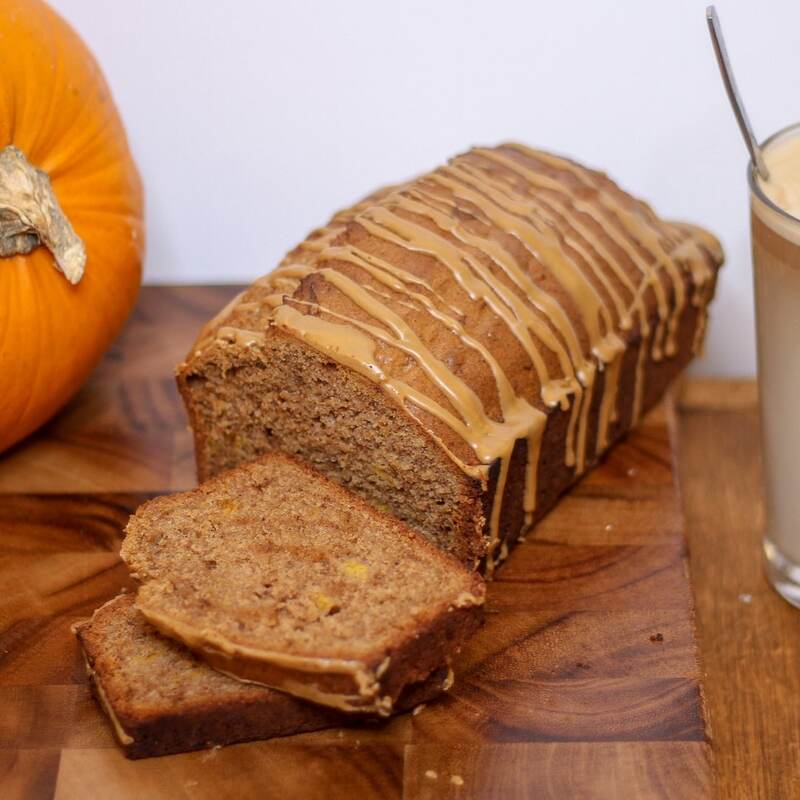 This pumpkin spice cake is perfect for an autumn treat. You can now relax and enjoy a slice with your hot drink of choice.